Frequency Resp. Up to 90kHz. 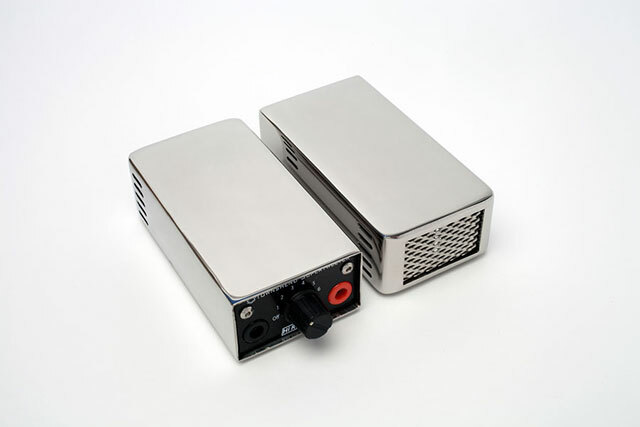 Amplifier power: Up to 400W, unclipped music. Rating to DIN IEC 268: 500w peak. Max sensitivity (2.8V @ 1m): 89dB. Nominal impedance: 11 ohm (min), rising to 20 ohm. Six position level switch which allows for seamless integration with your speakers. 1.5m link banana or spade cables provided. In the same way that a sub-woofer extends the low end of your system, Maximum Supertweeters reveal a wealth of detail in the midband and treble. Most striking tough, is the amazing improvement in bass detail. Maximum Supertweeters reproduce high and very high frequencies in the most coherent and realistic fashion, delivering a rich harmonic structure that dome tweeters simply cannot match. Coherent high frequencies affect the brain both physiologically and psychologically,revealing the full potential of your favourite recordings. Maximum Supertweeters enhance and define bass, mid and treble. They are the key to high resolution. Maximum Supertweeters heighten the sense of realism in music by extending the frequency response of conventional hi-fi speakers up to 90kHz. Although this is way above the theoretical limit of human hearing the presence of these frequencies creates a sense of naturalness and reveals detail right down into the bass. Maximum Supertweeters allow you to get utmost pleasure from both digital and analogue formats by accurately revealing high frequency detail above 6kHz. Even though a CD cannot produce information above 20kHz Maximum Supertweeters make the format sound more natural and reveal a wealth of extra detail when compared with dome tweeters. This is because of the much faster response of the ultra-light ribbon diaphragm when compared with the much slower response of a relatively heavy dome assembly. The Maximum Supertweeter works from 6kHz upwards making it better able to produce the leading edge of each transient without time smear. That’s why it makes a system sound more relaxed and natural, as it can respond to the signal with greater speed and greater accuracy. What surprises people the most is the extra detail that they hear in the bass. You might expect the greater sense of ease and openness which they introduce but the harmonic detail that is revealed across the entire audio band is nothing short of miraculous. The Maximum Supertweeter is engineered to integrate with all high quality speakers with simple connection utilising the 1.5m link cables provided. The Supertweeters are wired in parallel with the main amplifier feed or the tweeter connection at the main speaker. 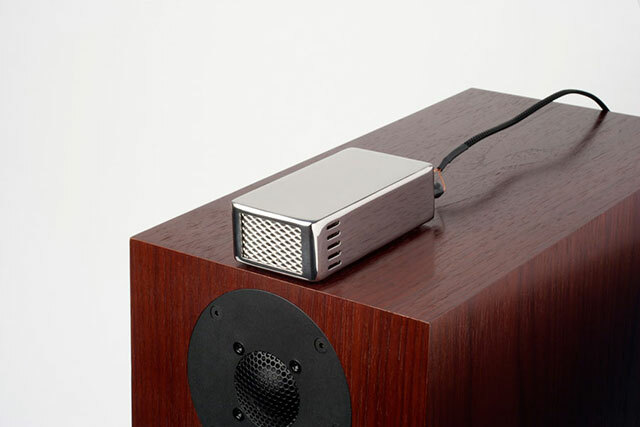 There is a six position level switch which allows for seamless integration with your speakers. In the early seventies, I made a version of the HQD speaker system which comprised two Hartley 24” bass drivers, a pair of stacked Quad ESL-57s and a pair of Decca Ribbon speakers (see http://www.marklev.com/systems/). The Decca’s were used as supertweeters here to augment the treble roll-off associated with the ESL-57s. Inevitably, the ribbons got damaged and repairs were routine and I became adept at repairing them. This system sounded awesome and I was a sad chappie when I had to leave all behind in Sydney when I came to the UK in 1978. I had, however, been bitten by the supertweeter bug and I spent the next 15 years or so looking for the ideal supertweeter. The Pioneer supertweeters were amazing, but they were very bulky and were not a complete “package”, and the now defunct the excellent Murata spherical radiator Supertweeters had no level control and were very expensive. So I set about making a suitable unit in the Townshend Audio factory here in the UK. 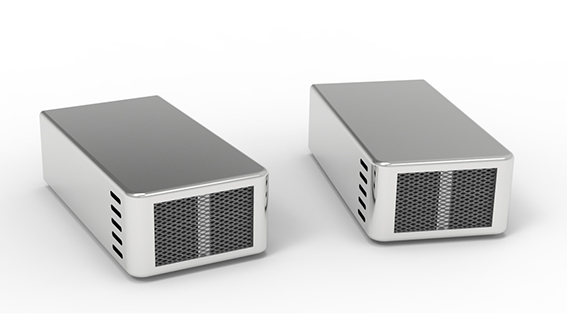 After two years of frustrating development, the Maximum Supertweetersarrived, in their cute miniature polished stainless steel case, in 1999, (now available also in satin black or matt silver). The secret of their success is the simplicity of the design and the set-up procedure. The 6-position crossover/level control allows them to integrate with speakers having a very wide range of sensitivity and their very small size allows them to fit in to almost any situation. Further, the supplied interconnecting wires make installation a doddle and there is no extra purchase necessary except for the Quad 57 brackets if needed. Why do they work when we can only hear up to about 15 kHz and the Maximum Supertweeters extend to 80 kHz? The standard test for frequency response is to play a pure tone sine wave and to ask the listener to indicate if they can hear it or not. This test is basically flawed since sine waves rarely if ever occur in nature. Extensive research has shown that it is the combination of the lower frequencies with the high frequencies that makes sound more realistic, just as a high resolution digital image looks clearer than a low resolution image because of the sharper delineation of the visual edges due to the higher amount of information in the hi-res image. So it is with audio. The ear is very sensitive to very fast transients and is able to detect very small time arrival differences between the two ears. This capacity evolved in the wild where it is essential to hear the slightest unnatural sound (breaking twig) when sleeping in the open. This capacity only diminishes slightly compared with normal frequency roll-off sensitivity to sine waves with age- related hearing loss. Many normal sounds have frequencies extending way above 20 kHz, (see http://www.cco.caltech.edu/~boyk/spectra/spectra.htm), hence the popularity of high resolution audio in the form of Hi-Res downloads, SACD, DVD Audio and quality vinyl replay. The higher the bandwidth, even up to 100 kHz, makes a difference in the fidelity of the overall perceived sound. This can easily be proved experimentally. Latest research suggests that the very high frequency sounds are picked up by the temple and even the eye, where they are sent directly to the brain by neuron transfer, totally bypassing the ear. Why do Supertweeters work on CD replay which extends only to 21 kHz, when the speakers extend to 20 kHz or beyond? The most common tweeter is the dome tweeter. The dome tweeter may measure well on sine waves, but, when playing music, less than 1% of the electrical energy sent to the tweeter is converted to sound, the rest being dissipated over a short time by rippling around the dome, while slowly converting to heat. The wave pattern of this dissipating sound is chaotic, not unlike the wave pattern in the sea on a rough day in an enclosed harbour. The Supertweeter however, which gently rises in output from about 12 kHz up, does not suffer from this problem as the ultra-light ribbon ceases moving almost instantly when the signal stops. This ensures a very accurate high frequency transient response where before there was smearing. An interesting property of the ear is that it responds to the fastest rise-time signal, from the supertweeter and ignores the jumbled time- smeared output from the dome tweeter. 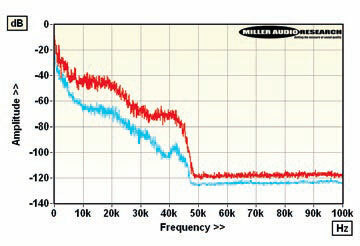 This is why it is unnecessary to attenuate the existing tweeter when adding the supertweeter. How do they sound? The effect on the sound with the addition of the Supertweeters is quite unexpected. Bass notes sound clearer, especially plucked string bass. Everything in the sound stage appears cleaner and smoother with far greater width and depth. There is a sense of ease about the sound. The effect is most profound when the supertweeters are taken away. It is not subtle! A peculiar effect is that they are inaudible in the listening seat when the main speaker is disconnected. The ear works in mysterious ways! And there are many thousands of happy Supertweeter owners out there who will, agree. The story behind the development from Max Townshend “How the Maximum Supertweeter was born“. Somewhat initially skeptical, Tony Bolton soon finds the Maximum Super Tweeters a permanent fixture in his home HiFi system…. Tony’s conclusions that both musical instruments and our response to their stimuli extend into the ultrasonic spectrum seem to hit the nail on the head. Listening to music with out them is sacrilege. Hi-res music sources carry musical information way beyond 20kHz, while modern tweeters and amps can deliver it to your listening seat. But what are we actually hearing, asks Paul Miller. 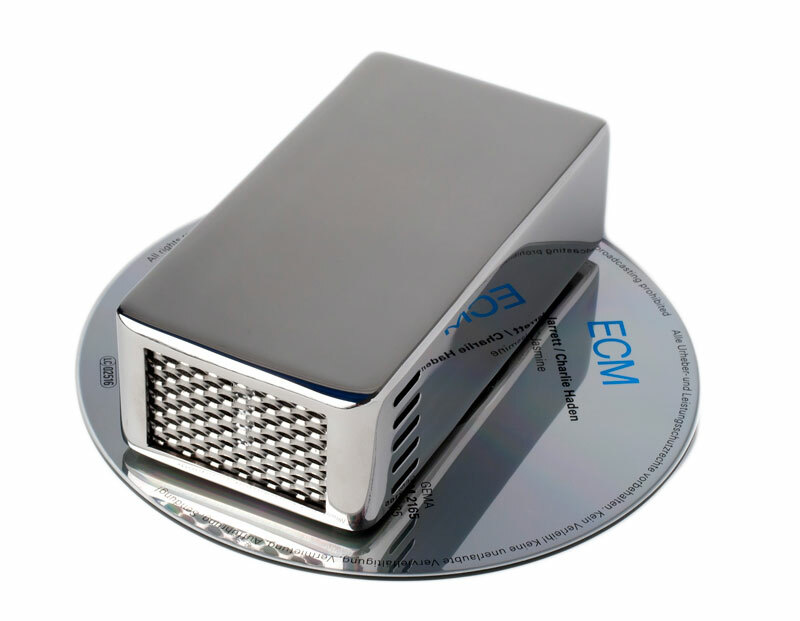 From the very first moment that CD landed on our shores, audio diehards were unconvinced that its limited 44.1kHz sample rate and mere 16-bit quantisation accuracy was anything like sufficient. The sample rate came in for greatest criticism because it limited the practical bandwidth to 20kHz. Surely we needed a wider frequency response – closer to 40kHz, perhaps? With the advent of DVD (Audio), SACD and, most crucially, the burgeoning availability of ‘high resolution’ 96kHz music downloads, that’s exactly what we’ve now got [see Graph, below]. And most of us reckon our hi-fi systems sound all the better for it. However, the medical community is still at odds as to how, or indeed if and why, sonic content above 20kHz should be perceptible at all. So who’s right? But the literature bears close examination. First off, a team from Tokyo’s NHK Science and Technical Research Labs reported a ‘Perceptual discrimination of very high frequency components in musical sound…’ [AES Convention Paper 6298, 2004]. The experiment involved two separate digital reproduction chains, one feeding musical content below 20kHz into B&W 801s which were augmented by Pioneer PT-R9 supertweeters fed content expressly above 21kHz. The master tracks were recorded at 192kHz using microphones with a response extending to 100kHz, albeit with a broad +10dB uplift above 10kHz. The ultrasonic portion of the recording was switched in and out and the reaction of some 13 test subjects evaluated. To paraphrase, although their sensitivity was linked to the duration of the (listening) test, two of the panellists were reportedly able to discriminate between the 20kHzlimited and full-bandwidth versions with decent statistical odds.Interestingly, when the response of their hearing was measured with standard tones, neither panellist exceeded 22kHz. As the researchers concluded ‘We have no hypothesis or scientific reasons that can explain this finding…’ It is worth bearing in mind that the audio and ultrasonic passbands of the two parallel speaker chains were separated by very high order FIR filters, achieving a ‘It is postulated that our eyes may act as acoustic lenses for our ears’90dB rejection within a transition band of just 1kHz. So were these subjects really listening to ultrasound in the raw? Plain vanilla CD uses a similar low-pass filter regime and it’s the inherent phase distortion, among other mechanisms, that we seek to avoid with 96kHz+ digital recordings and their gentler, higher frequency filtering. So while 96kHz/192kHz digital audio encompasses the ultrasonic it may sound better simply because any debilitating numbercrunching is deferred to inaudibility. But perhaps there’s another reason to doubt the correlation between the ‘response’ of our hearing and our perception of ultrasound. A reason, in part, that lies in the use of headphones to measure human hearing response. As a more recent submission to the International Tinnitus Journal [Vol. 13, No.1, 3-10 (2007)] suggested, our eyesmay serve as ‘fenestrations to the ears’. Having measured the physical frequency response of the eye up to 60kHz, it is postulated that our eyeballs may act as acoustic lenses for the ears, ‘passing frequencies beyond the impedance-matching capacity of the eardrum.’ No listening tests here but electroencephalograms that illustrate physiological activity in the brainstem and thalamus ‘when ultrasonic musical frequencies are combined with the musical spectrum below 22kHz.’ Whichever sage suggested that our ‘eyes are the windows to our soul’ was probably onto something. The reason for this musing? 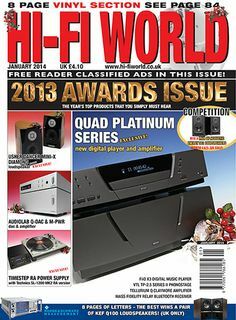 A clutch of journal reprints on this very subject mailed to Hi-Fi News, among others in the industry, by Townshend Audio. Bearing in mind the company manufactures an add-on supertweeter, it not unreasonably has a vested interest in the subject. HiFi Choice Award Edition 2011 - Strictly for the bats? To extend high-frequency reproduction to 100kHz seems batty, but says Jimmy Hughes, Townshend’s Super Tweeter is supersonic. The case for subwoofers is fairly easy to make. Most loudspeakers are limited in terms of size and this leads to restricted bass depth. Very few can reproduce frequencies much deeper than 30Hz (and many don’t even get that far), so there’s an obvious need for something to reproduce those lower octaves. Now you might expect a set of super tweeters to increase sharpness and give the sound greater upper-frequency immediacy and impact. This it does, but-and here’s where it gets a bit scary-you also notice improvements in apparent bass depth, along with increased lower-frequency tightness and control. Amazing! Subjectively, it’s akin to the way a good subwoofer makes the treble seems smoother and more ‘airy’, increasing the impression of 30 spacious depth and tonal richness. Although you’re only bolstering the lowest frequencies, the improvement seems to come in the midband and treble areas. In much the same way, a good super tweeter seems to give you a tighter; cleaner bass, with reduced boom and overhang. Yet, turn off your main speakers and listen only to what ti1e super tweeter’s are doing-the noises they’re actually making -and it seems incredible that it could be making this sort of difference. One of the key aspects of getting great results from a subwoofer is-don’t have it up too loud. When you first get a sub, there’s a tendency to adjust it so its contribution is ‘obvious’. But paradoxically, subs produce their most profound effects when their presence is subliminal. You should only notice a sub when it’s switched off. It’s exactly the same with a super tweeter; you need very little. Indeed, it’s been our experience (going back more than twenty years) that the less you have, the more profound the overall effect on sound quality becomes. We always use our Townshend Super Tweeters with them set to ’1?, and often wish there was a lower setting. The question is -how and why do super tweeters (and subs) contribute so much, yet (apparently) seem to do so little? In our view, it’s to do with being able to move air at sub-sonic and supersonic frequencies, making it easier for frequencies in the audible range to couple-better to the air. By setting the air in motion at extremely high or low frequencies, you help the drive units to move the air in the middle-frequency areas where the bulk of the sound is. Imagine a sharp blade trying to cut through something stiff. If you were to vibrate it at supersonic frequencies, it would cut more efficiently. For this reason, you don’t actually have to ‘hear’ the contribution made by your super tweeters to notice the effect they have on the overall sound. Indeed, if the contribution is too strong, the result is counter-productive – the sound becomes messy and harsh, with excessive high-frequency emphasis. When a super tweeter seamlessly integrates, you get a focused quality of sound that has an innate clarity, while also displaying a spacious airy quality that creates holographic 3D ‘out of the boxes’ stereo imagery. Transients have increased attack, yet the treble itself is effortlessly smooth and open. Given that most loudspeakers are more obviously deficient at the extreme low-frequency end of the spectrum, a good subwoofer probably gives you a bigger bang for your buck. But a super tweeter like Townshend’s Maximum is likewise capable of adding an extra dimension that has to be heard to be believed. Townshend Maximum Super Tweeters are capable of having a profound effect on sound quality -and not necessarily in ways you might expect or predict. A hi·fi enthusiast for four decades, Jimmy’s knowledge of system-matching and record-collecting are unmatched in the industry.